WWII Vet's Purple Heart Returns to Pa.
Gordon H. Yates was a tall, skinny redhead who joined the Navy during World War II when he was 17. Two years later, the young aviator was dead, beheaded by the enemy after his patrol bomber was shot down in waters off southeast Asia. Saturday, Purple Hearts Reunited presented the medal he was awarded decades ago to his sister in southeastern Pennsylvania. Yates' family had lost track of the medal at least as far back as 1979 when his father died. Yates' 80-year-old sister, Alva Brickner, now afflicted with Parkinson's disease, can't communicate very well, but her son said her reaction was unmistakable when he told her the medal had been found. Yates was aboard a patrol bomber flying its 36th mission when it was shot down, according to an account provided by Purple Hearts Reunited. The crew made it to shore and hid in the jungle _ aided by French Resistance fighters _ but Yates and his mates eventually fell into Japanese hands. While some of Yates' comrades were shot, Yates was beheaded on April 27, 1945. He was 19. Zachariah Fike, founder of Purple Hearts Reunited, surmised that Yates was either defiant or perhaps his captors believed they were according him an honor by killing him with a sword. "No one will ever know why,'' said Fike. Daniel Brickner said he believes the Purple Heart _ a combat decoration awarded to those wounded or killed in action _ was likely in the possession of his grandfather, then inadvertently sold at an estate sale following his 1979 death. The medal wound up with a woman in Ashland, Va., who had it for more than 30 years. 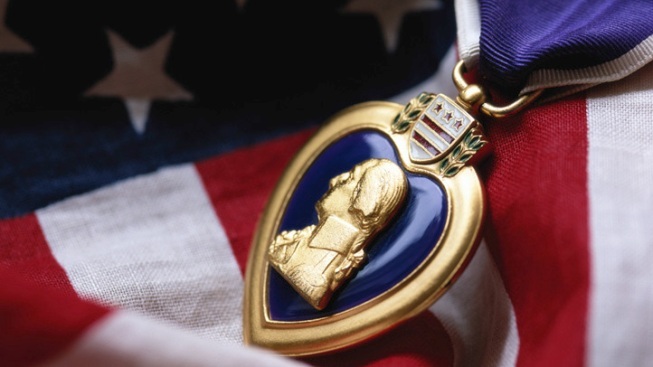 The woman recently told the adjutant of the Richmond chapter of the Military Order of the Purple Heart that she couldn't remember where she got it, but had always planned to find its rightful owner. At some point, the Purple Heart was misplaced. But the woman recently located it in her home again and turned it in, according to Fike, whose nonprofit has returned 60 lost or stolen medals. Fike presided over Saturday's ceremony in Narvon, Lancaster County, where Alva Brickner lives in a nursing home.